Based on true events from the most recent episode of our podcast. I just got finished playing through the most recent Spider-Man game. It’s definitely a very fun game, but it’s not perfect. Having your webs connect to some arbitrary point in the sky rather than buildings takes a lot of the fun out of swinging around the city. The game does, however, do a fantastic job of making you feel like Spider-Man as you beat up the bad guys. I’d probably still say that Ultimate Spider-Man is my favorite Spider-Man game, though it definitely shows its age. Now I’m playing the new Transformers game, Fall of Cybertron. I loved the first one, and I’d say the sequel is even better. I guess I just like it when Optimus Prime tells me to transform and roll out, and then I push a button and IT HAPPENS. 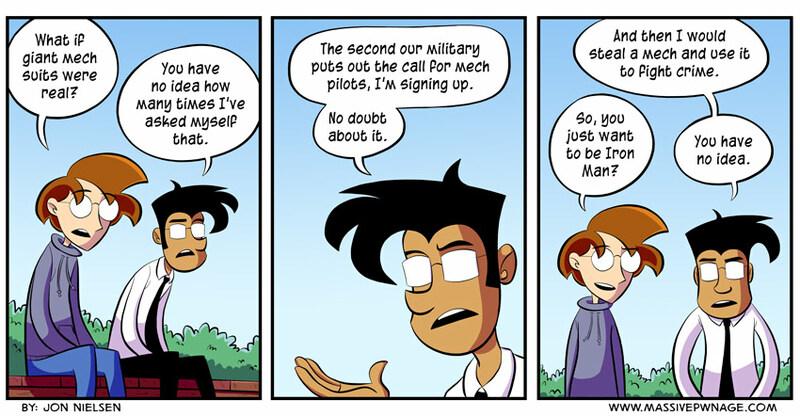 This entry was posted on Friday, October 12th, 2012 at 12:00 am and is filed under Comics. You can follow any responses to this entry through the RSS 2.0 feed. Both comments and pings are currently closed. This sounds sneakily similar to a certain podcast. ah, nice feeling to not be alone, only difference is I’m waiting for human augmentation and DNA re-writing.